The Delaware Bill of Sale Forms are legal documents that will prove the sale, purchase, and transfer of ownership of a motor vehicle, vessel, or gun/firearm or even personal items from an air conditioner or puppies to livestock. Generally, the transaction is complete on the day of sale which would require that all monetary transactions or trades, must be completed prior to the transfer of ownership on the date and not at a future time. Some documents will require witness and/or notarization. Boat Bill of Sale – To be used for the purpose of sale, purchase and ownership transference. Firearm Bill of Sale – Used to sell, purchase, transfer ownership and register a gun. General Bill of Sale – Generally used for the sale, purchase, and transfer of ownership with regard to personal items. 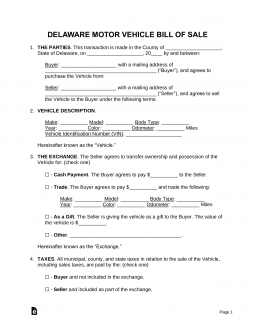 Vehicle Bill of Sale – This document is generally used to sell, purchase, transfer ownership and register an automobile or motorcycle. If the boat is titled in a different state, the original title must be submitted and will be kept by the state.